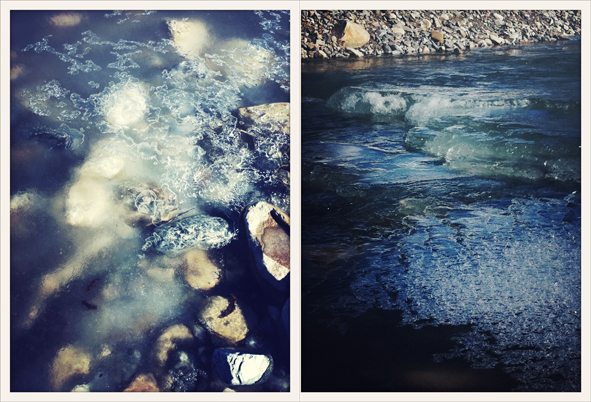 Nature is amazing, today while driving I spotted and had to turn around the car to stop and capture these frozen waves that are part of a normally free flowing river. It made me think about transformation, do you ever have interesting thought-provoking moments with the forces of nature? What magical nature scenes or moments have you seen lately? What gorgeous photos- I'm more than impressed and would love them blown up and hanging in my home. These snapshots are seriously breathtaking! I ponder nature all the time; the seasons, in particular, serve to remind me just how quickly time goes by and how I should try to savor certain moments. Because when you get down to it, life is incredibly short so it's best to make the most of it. Really lovely post. I often times have thoughts like this.. nature is the best place to think freely. that is stunning. i would have stopped too! really all of this ice and snow in dallas is pretty magical...if not for the fact that it's so rare for us... a totally different "landscape". so, so pretty! That's so beautiful! It's so good you took the time to stop and take those picture. Too often we take nature for granted. Besos! we are lucky enough to have a river right outside our studio and we never tire of the bald eagles, fish, ducks and waves the pass us each day. we're so lucky. What beautiful photos. If only time stood still like this! Wow that is amazing! I would have never imagined a frozen wave, but I guess that is the beauty of nature. I have those moments all the time when I feel in awe of nature...even just the little stuff. Absolutely gorgeous! I love those moments when time stops from the beauty of nature. Thanks for sharing. wow the photos are beautiful!!! Thanks for sharing! Love the peacefulness nature gives! Nice photos, I'm starting to be in photography. I wonder where could I get such pictures like this. But anyway it gives me a new idea on what to take pictures with. Thanks for the post. This place look so beautiful. Where is it? Just goes to show, whatever we can do, Nature can do better!